If you’ve been blessed with an extrovert child but you’re a self-confessed introvert, below you’ll discover some great tips to help parent them without getting overwhelmed. There’s no doubt about it – raising an extrovert kid when you’re an introvert parent is exhausting! They need constant social interaction, which unfortunately eats into your strong need to spend time alone. This means, you’re going to need to find plenty of opportunities to recharge your batteries. It’s good to teach your toddler to spend little periods of time playing alone as this will help give you a little much-needed peace, as well as teach them how to occupy themselves. Even extroverts need some time alone! However, you’ll also want to make sure you can take some time purely just for yourself. Ask your partner to take over or ask friends and family for help so you can get at least one day a week to recharge. Of course, you don’t have to be the only person to entertain your toddler. Arranging for them to spend lots of time with others can really help. Take them to play dates and toddler classes in your local area. While you’ll still be there, you won’t need to do as much as you would if you were trying to entertain them at home. Spending time with others is also crucial for your toddler’s development. It will help to improve their social skills, as well as their confidence (if they even need it!). Following on from the last tip, enlisting the help of friends and family is a great idea, especially if they are also extroverts. If your partner is more extroverted than you are, you can ask them to take over a little more. They won’t get as tired as you, plus they’ll have a similar personality to your toddler. You can also lean on your partner for emotional support when you need it. Even if it’s just getting them to watch your toddler while you do the washing up alone. This gives you chance to relax and enjoy a little peace. If you don’t have a partner, your friends and family can help. Whoever you have in your immediate circle, don’t be afraid to ask for their support when you need it. Is there anything more mortifying than a toddler public meltdown? Attention of any kind is bad enough when you’re an introvert, but negative attention can be a killer! While you can’t avoid public meltdowns, it is possible to plan ahead to ensure they cause minimal disruption. Some parents swear by having a selection of toys their toddler can only play with when they’re out of the house. Or, you could use healthy snacks as a bribe if you suspect the meltdown is hunger related. If nothing works to calm them down, you can always just leave. It may not be ideal but taking yourself and your toddler out of the situation calmly will minimize the embarrassment and energy it takes up. It’s a good idea to chat to your toddler about the differences between extroverts and introverts. Explain that introverts, like yourself, need more time alone. While they won’t be able to understand the complex differences, they will start to respect and appreciate your need for more personal space. It’s important for children to learn more about the different personality types. Understanding the difference between introverts and extroverts will help them to better socialize with their peers. While as an introvert, you do need more time alone, it can be really useful to make friends with another introvert parent. While it’s great to have a wide variety of friends, extroverted friends aren’t going to understand your need for personal space. They’ll expect you to go to all kinds of events and play dates. An introvert friend on the other hand, knows exactly what you are going through. You’ll be able to talk to them about your experience and the troubles that come from trying to raise an extroverted toddler. This kind of support can prove crucial during the toddler years, enabling you to swap tips and lean on each other when times get tough. Extroverted toddlers do tend to get bored more easily. The trouble is, when they are bored, they are going to come looking to you for entertainment. A good way to prevent this, is to make sure you’re providing them with activities which really engage them. It could be getting them to act out a puppet show or putting on a live performance for everyone. You’ll find that extroverted toddler LOVE drama. So, anything which lets them be dramatic is also a good activity to consider! Finally, the last tip is potentially the most important – don’t feel guilty! As parents, we’re wired to feel guilty about practically everything to do with our kids. It’s natural to feel like you’re letting your toddler down or you’re a bad parent for needing a little more space. However, you need to remember that everyone is different. Just because you need a little more alone time than an extroverted friend, doesn’t make you any less of a parent. 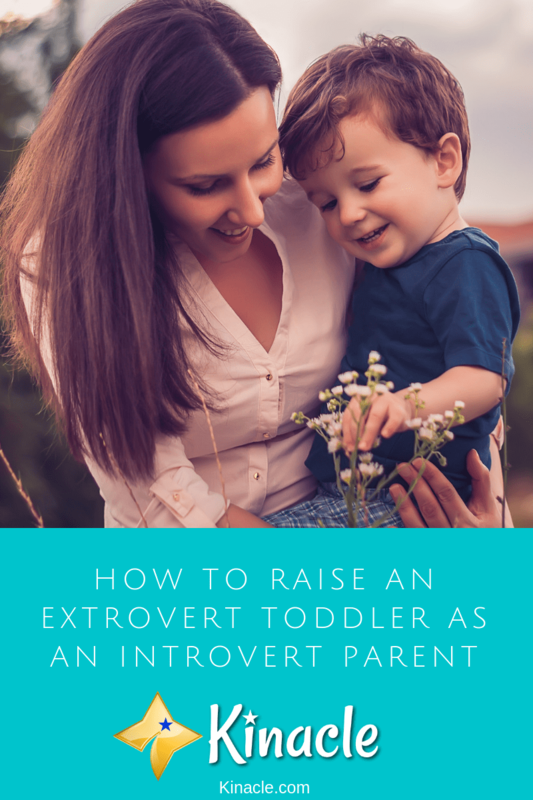 Overall, it can be tough raising an extrovert toddler when you’re an introvert parent. However, it can be done without you losing your sanity! The above are a selection of the best tips you can follow to make raising an extrovert toddler much easier.